I’m not sure I’ve ever had a panic attack before. There was one time I got lost on a mountain in Ecuador (a story anyone who knows me has long grown tired of hearing). I think I came pretty close to a panic attack then. I’m certain I came even closer one day while cycling Vietnam. We had just finished a tour of My Son. To continue on our cycling journey, we had two options: return the way we came and then head south (adding an extra 30 km) or take a shortcut. I know. You’re thinking shortcuts are always a bad idea. And now we know you’re right. But Google Maps said we would only have 5 km of dirt and mud before a highway greeted us, and that sounded like a pretty good deal. Plus, I hate backtracking like nothing else. We thought it over for about .5 seconds then took a left. Shortcut it was. Little did we know this highway Google Maps promised was nothing more than a gravel path. Only, it wasn’t gravel in the traditional sense, because the rocks that constituted the road were larger than my fist, muddled with potholes great enough to swallow a cow. Of course, this whole debacle was uphill, through the most remote route we’d been on so far—no people, no towns, lots of construction facilities. It was somewhere while pushing our bikes up the rocks (we had long deemed cycling it impossible) that the first bit of nerves crept in. With two hours of daylight left, I brushed them aside, convincing myself we had plenty of time to find something…right? As if on cue, just when we were exhausted and questioning how much farther we could press on, the entire sky above us turned black. Our few remaining moments of sunlight were instantly snatched from us. The wind blew harder, the air got cooler. Before we had time to sense its coming, a storm was upon us. We knew we were in trouble the moment the cows began frantically running past, seeking shelter from the fury that was about to be unleashed. 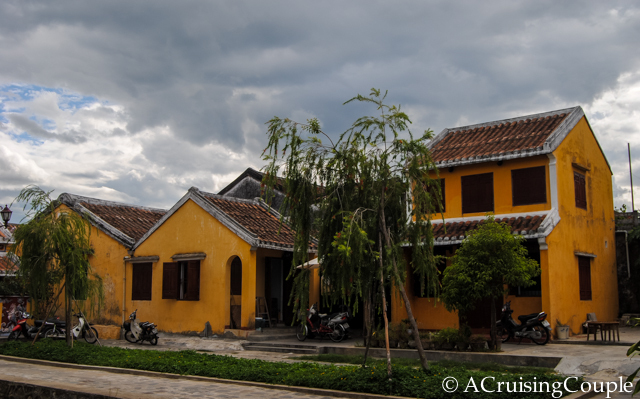 We were officially stuck in the middle of who-knows-where Vietnam, unable to cycle due to the hazardous road conditions, uncertain as to how far a hotel or even town would be, and accompanied by the largest storm clouds we’d seen yet. Mr. Panic attack was determined to overpower me. In the midst of the tears and fear creeping in, a miracle intervened. We suddenly came across a small strip of five humble homes, the first ones we had seen the entire afternoon. With no other choice, we picked one at random, knocked on the door and inquired how far to the nearest hotel. A young girl with her mother and father huddled in the doorframe. 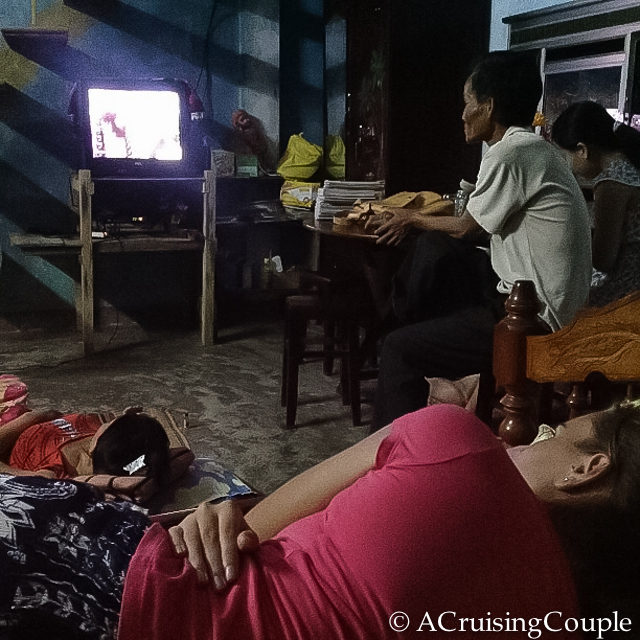 Though they knew no English and we no Vietnamese, they quickly understood the situation and our need for shelter. They looked at us questioningly, looked harder up at the sky, looked back at us once more, and then shyly motioned us inside their own home. No longer than a moment after we pulled our bikes under their porch did God open up the sky. The thunder was deafening and the lightning furious as the pounding rain made any vision past a few feet impossible. We had never been so grateful for a roof over our heads. The family who took us in was reserved. Typically Vietnamese have little concern for personal space; we have become accustomed to being petted and poked, our bikes examined, our possessions fondled. This family was different. They had a gentle demeanor. I couldn’t determine if it was of embarrassment or suspicion; regardless, their kindness was quickly made evident. The father insisted we take one of their two beds, making ourselves at home on the bamboo structure. The mother cooked dinner over a wood fire out back, serving eggs and rice and apologizing all the while for the lack of meat. While their means were few, they insisted on refilling our bowls again and again until we truly could no longer manage another bite. The shower was a bucket of rainwater behind a tarp and adjacent to their three pigs. When I asked for the toilet I was told it must wait until after the storm—the village’s communal restroom was a long walk away. After dinner we all congregated in the house’s main room to watch TV; it was clear this simple piece of technology was the most prized and valued possession in the home. It was here that I noticed the father had a false leg. It’s a minor detail and not of importance, but after visiting the Mine Action Visitor Center, I couldn’t help but wonder if it was the result of a landmine. And if this was so, his graciousness to welcome two Americans into his home seemed all the more generous. We couldn’t learn much more about the amazing host family that had accommodated us. The daughter’s English books were our only translation devices. However, it didn’t take language to understand the kindness of this small family. They took us in, cared for us, fed us, helped us on our way, and didn’t request anything from us in return. Many travelers in Vietnam tell tales of being taken advantage of by all the locals, ripped off and overcharged, only viewed as a dollar sign. It breaks my heart to hear these stories, and to know they were unable to experience the same side of the Vietnamese people we did—to feel the overflowing kindness we were blanketed with. The next morning was bright and beautiful, the kind of sky only made possible after a storm has come through. It took us over an hour before we spotted a hotel—God only knows how long that would have taken the night before, what electronics would have been damaged along the way, what other dangers we might have faced. The experience really got us thinking. If two foreigners who didn’t speak our language came to our own door, would we let them in? If we had nothing to offer, barely enough food to feed ourselves, would we so graciously share with these strangers? It sounds in part like morals from biblical times, and similar variations of the same story have been told again and again. All the same, I can only hope we would be so kind should the reverse situation ever occur. What would you do if we were the strangers who knocked on your door? What’s the most terrifying situation you’ve encountered while traveling? Let’s hear your stories in the comments below! Great story and great moral. I know I’ve been in similar situations and it really reinforces your faith in humanity to experience these random acts of kindness. We experienced so much kindness in Vietnam but this family really proved how generous people can be. Really good question. Before I’d started travelling, I’m not sure I could say that I would let in two strangers with whom I didn’t share a language and had nothing to offer, but now…I’d like to say yes, but it’s a hard situation to imagine still. Either way, this is indeed a lovely story; so glad you had such positive experiences in Vietnam, and with the people. Looking forward to more! What a gorgeous story! It still amazes me how complete strangers can be so kind and utterly selfless. When I was refused back on a plane in Singapore during a journey from Auckland to London because I was too sick to fly a complete stranger in the doctors surgery offered to pay for my medical treatment if I didn’t have enough money for it. I did have enough but it was so sweet of him to ask and to care about me, even though I was no-one to him. That’s the thing about those tropical countries: storms just open up seemingly out of nowhere. However, we did have a same kind of experience in Scotland. We were walking up a trail around Arthur’s Seat and the skies went from sunny to hailing and clouds. We were stranded up there for about five minutes and it was freezing. But, then it went right back to sunny, just like that. We were lucky to only have a couple of days of rain while cycling, but those SE monsoon rains will sneak up on you real quick! Oh my – I just love this story. What incredible kindness. I hope I’d do the same, but I’m not too sure. Thank goodness for good people in the world!! Rika | Cubicle Throwdown recently posted…Doing my part – a lionfish recipe. We’d like to hope so too. It is definitely more likely now that we know how it feels to be on the receiving end of such selfless giving. Taiwanese are some of the most hospitable people on the planet. It seemed like every time we flagged someone down to ask for directions they ended up driving us there or would guide us to make sure we arrived safely :-) Glad to hear you’re experiencing the same kindness. Love this story! It really restores your faith in humanity. My husband was off-roading once in the desert outside Las Vegas and got completely stuck. It was so middle of nowhere, there was actually a dead cow decaying and he was convinced if he started digging, he’d uncover Jimmy Hoffa. Low and behold a random guy showed up, towed him out, and gave him a ride back to our apartment. We invited him in for dinner for his act of kindness. During our motorcycle ride through Vietnam we had a similar thing happen, only we actually got caught in the rain and something in our bike got wet which then caused the bike to stall and cease running. Thankfully it happened right in front of a small store, and the owner and her family waved us over to take shelter while the worst of the rain passed. They too spoke no English, but we appreciated their hospitality nonetheless. Throughout our time in the country, we were constantly encountering people who simply wanted to help us out or spend time with us. Although we encountered a few scams along the way and undoubtedly were taken advantage of at times (e.g., we would by amazing banh mi sandwiches from roadside vendors and get charged 7000VND, whereas locals were only being charged 5000…) we also experienced some of the most extraordinary displays of generosity out of any place we have every been. Vietnam is really a special place when you are able to give yourself over to it! What a lovely story! The kindness of strangers is something I come across more and more during my travels. And what a great way to mingle with locals. It must be one of the most memorable travel experience for you. I was feeling a bit of panic with you as I read, but it sounds like it turned into a great experience. We are definitely grateful for their selfless giving and turning a terrifying afternoon into a memorable experience. Never had a panic attack, but really understand how cycling in Vietnam in the middle of nowhere can cause it. The hospitality of Vietnamese locals in your case was so amazing. I’m so surprised as we didn’t come across such nice people when riding there. We feel we were very lucky to have them take us in. I just wish there was a way we could return the favor. What an awesome experience you were able to have! So many times when I have been traveling I have wanted to just see how the local people live in their homes. It’s so nice you were lucky to find a kind family when you were in such a stressful situation. We were pretty worried that afternoon when the clouds started rolling in that this was going to be a night we wouldn’t forget. Luckily it will be unforgettable for a different reason. I have found in my travels in mexico any time i really needed help someone comes and helps, i think its in all of us to help People who really need it. When they help my ill give a tip did you? Because I have been the recipient of many kindnesses when traveling I do try and extend a helping hand to fellow travelers – but would I have done what this family did? I’d like to think so but I guess I’d have to size up the situation. It does make you think. It turned into a great story but what a predicament you were in. 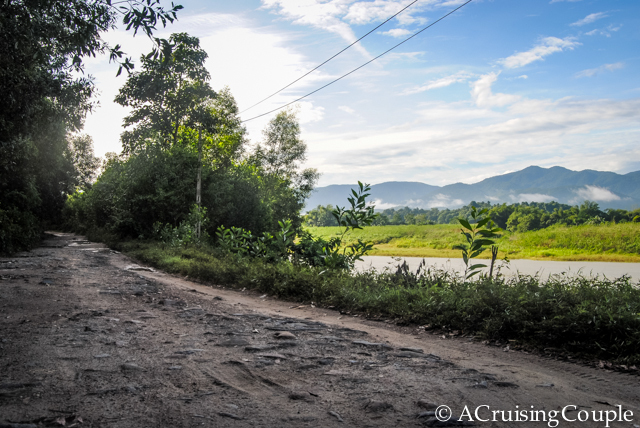 I have cycled in Vietnam – by far the craziest place anywhere – except for maybe Ireland – to bike. 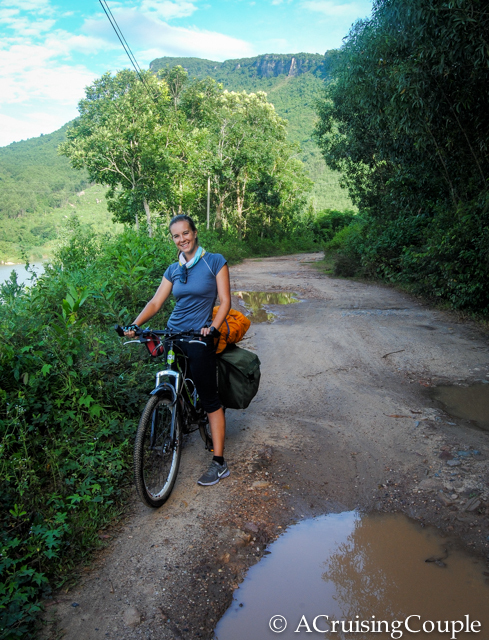 Vietnam was our first true cycling test and it sure did prove a crazy ride. Ireland sounds like it would be an interesting trip as well! I’ve always heard that animals are the first to sense danger. I would have been totally freaking out! I’m not sure I would have been brave enough to knock on some stranger’s door, though. What an incredible story! There kindness and generosity is really inspiring. They definitely knew what was coming and we were very lucky to escape the storm. We will always remember the selflessness from that night. What an amazing story! In my opinion the kindness of locals is always one of the most pleasant thing that can happen. A great experience. Thank you for sharing it. Christopher recently posted…Do I really have to pronounce everything correctly when abroad? Wow, truly wow, what a great experience. The very definition of “the kindness of strangers.” I can’t say that I would do the same as the Vietnamese family did, maybe if I grew up in a smaller town or something. Being a “city-boy” I have that immediate distrust of anyone I do not know, it’s a jaded mentality I know. Though I also wonder if you weren’t a couple would there have been the same outcome if it were just a lone man wandering by in need of shelter. People seem to place more trust in a couple than a lone wanderer, more so a lone male wanderer. There goes my cynicism again. That being said I do feel that if you have good intentions about you, if you’re a good person, not seeking to bamboozle or harm people. People can pick up on that and may be more inclined to help. You make a lot of good points! Me being a woman does help gain peoples’ trust for sure. But like you noted, I do think there is a lot to be said for intuition about people. We always judge people by looking in their eyes, and that has served us fairly well when dealing with strangers on our travels. It’s a hard situation, because you want to trust people, but in the West we are brought up to be very guarded towards people we don’t know. Even after this happened to us, we would like to say we would take people into our home, but it is hard to know what we would do until it actually happens. Regardless, we certainly owe the universe a good deed in return! I just found your blog (thanks to your Srubba review, which I purchased immediately), so I’m late to the party, but what a great story and experience! I grew up in the country, and my dad routinely invited undocumented workers with whom he worked on the ranches to come to our house. We shared no common language (shame on us for not speaking Spanish when we live in Texas! ), and we didn’t have “extra” room, but they ate with us then bedded down for the night in our hall. I hope I’d still follow my dad’s example if presented with a similar situation. It was also not uncommon to get a knock on the door during a blizzard, and we knew it would be someone who ignored the signs for the closed highway who got stuck. We offered whatever we had because we know Karma is keeping score, so I have no doubt that’s what has led to the many kindnesses of strangers that I’ve benefitted from.